Did you see that! I slowed the van down to look back. 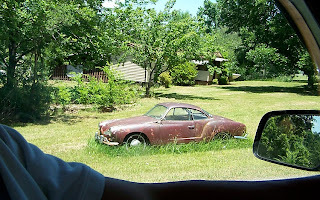 A Volkswagen Karmann Ghia abandoned on an island of weeds. This lawn ornament sat a dozen feet from a busy highway in Montevallo, Alabama. I wanted to turn around and get a photo. Cars in yards tend to disappear when you least expect it. My wife said we could take a picture when we drove back home. We, make that my wife, took the photo on our way home. My love for all things automotive continues. Many times I 've wished I had my camera or had time to stop and check out a cool automobile. Cars or trucks sitting in the weeds attract my attention immediately for two reasons. Number one, they are likely older vehicles and, two, their owner may be ready to part with them for a bargain price. The second reason makes my wife cringe any time I slow down to look at an old car. On this occasion she knows I'm at my limit of automobiles and I'm no threat to go knock on the door at this house. She is very supportive of my automotive hobby, but knows I can go overboard. I admit that we currently own too many cars. Between the two of us we have three kids and seven cars. Our oldest child is 7 -- eight years removed from a drivers permit. Ridiculous, I know. But think of it as recycling. Do you have a hunger for similar roadside attractions? Send your car photos to Junkyardlife. How many of you have more cars than people at your house? 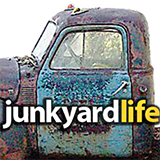 Share your car collection with us, send photos to Junkyardlife. my wife and i are both "junk junkies" and have a yard that varies between gridlock and "hope the code inspector don't happen to look"..we've got it so bad that we spend whole days roaming the back roads of northern cali looking for something to drag home. yea, we've got th car trailer complete with dual electric winches...i find my self muttering something simular to adam as i load another "project onto th trailer.."i don't need another yard ornament...i don't need another yard ornament." it's a sickness, but it keeps us out of trouble..(as long as that pesky code enforcement officer stays away). PS..dig th blog. i imagine i'll likely be a contributor before long...woo-hoo.